When did this Tiger ever stop roaring? Well…okay, Tubelight didn’t quite work. Salmaniacs didn’t want to watch him as a whimpy whiny crybaby hero. The message is hammered loud and clear in Tiger Zinda Hai(TZH), a homage to Salman Khan’s indomitable powers of hero-giri. From the first frame to the last blast, this is a fanboy director making sure that every moment of the narrative is paisa vasool for the Salman fans. 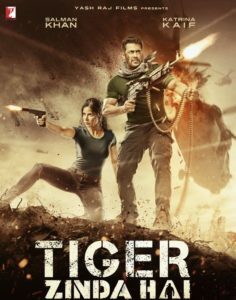 Tiger Zinda Hai is a 2 ½ hour homage to Salman Khan’s superstardom. In the cinema of the Southern superstars like Rajinikanth or even Mammoothy (see his latest release Masterpiece where in almost every frame the star is eulogized) it is common practice to extol the virtues of the Man Of The Moment, to the extent that the other members of the cast appear to be afterthoughts. Almost every supporting actor in TZH—and that includes the diligent Katrina Kaif –is an extension of Salman Khan’s superstardom, his or existence defined by how much he or she hero-wosrhips our intelligence officer Avinash Singh Rathod a.k.a Tiger. The lengthy eulogy gets tedious only when the actors pause to tell us what a daunting one-man army our hero is. And since that happens quite often, we are frequently asked to hold our horses, while the compliments flow and the speedbreakers are served up. Once those are out of the way TZH is a lot of fun to watch. The sheer silliness of a one-man army mowing mayhem across terrorism, at a time when heroes in cinema across the world are exposing their vulnerability more than their virility (see the haunting Call Me By Your Name to know what I mean) is laughable. To his credit, director Ali Abbas Zafar packs in quite a punch. The narrative takes us through a collage of quirky, appealing locations where some really well-choreographed action scenes are shot with breathless zeal. Full marks to cinematographer Marcin Laskawiec and action director Tom Struthers, not to mention the pulse-pounding yet discreet background score by Julian Packiam, for uplifting the viewers’ gaze to a level comparable with the Hollywood franchise. TZH looks like many other anti-terror films including Baby and Naam Shabana. And if you really want to see a taut intensely-felt take on the same plot about the kidnapping of nurses in Iraq, try the Malayam film Take Off. As for Katrina Kaif she remains as deadpan as ever. Thank God some things never change. But she’s surprisingly effective in the action scenes, more so than she was in a similar role in Kabir Khan’s Phantom, or for matter in Kabir Khan’s Ek Tha Tiger. As for her chemistry with Salman, his eyes melt like a icrecream cone left out in the sun, each time she’s around. Will someone make an intense love story with the two?